This always makes me sad. This weekend is the last for our farmer’s market at 14th and U: so stop by to stock up for the winter, pick up Thanksgiving day supplies, and say farewell to the vendors. The market will be back next May, but you can stop by the Dupont market in the interim, which is open all year. Sigh. My favorite time of the year is coming to a close: this weekend is the last you’ll be able to saunter down to 14/U and get farm fresh veggies, fruit, great Copper Pot sauces and pasta, bread from Panorama and those great pumpkin whoopie pies. Definitely make sure to get to the market this Saturday to stock up for the winter. I’ll see you there. Scott Brooks with his painting "Boldly Going"
Scott Brooks (remember the profile I did on him?) has a show at Long View (9th/N), entitled “We the People.” The opening reception is Friday night at 6:30 and then the show will run for a month, through November 28th. 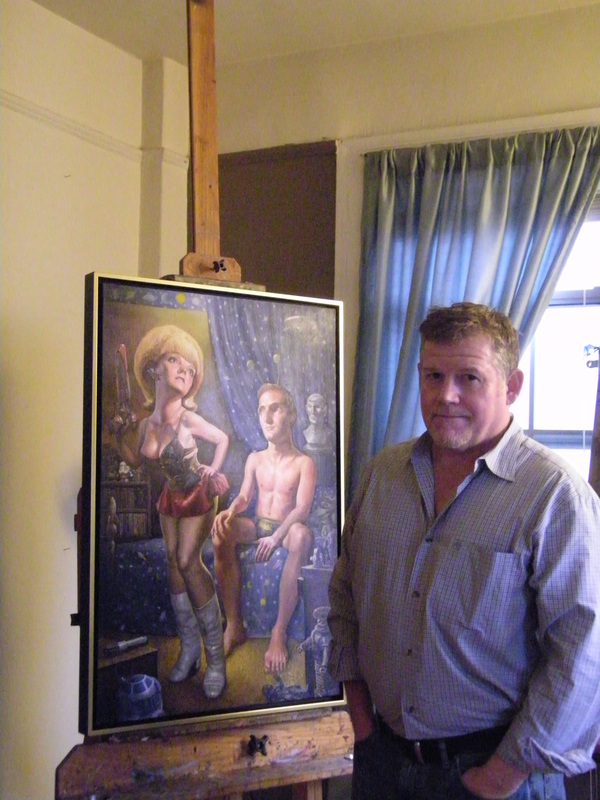 Scott is a local artist who does really interesting, fabulous work – so go out and support him! Transformer (14/P) is having an open house for their new exhibition, Tang: Freedom & Its Owner on Saturday from 1 to 7 pm. There will be flavored coffee and chocolates from ACKC to nibble on. 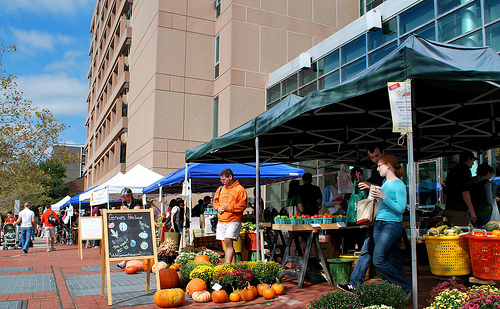 At the 14/ U Street farmers market, there will be a ton of cute things to celebrate Halloween. There will be a costume contest with prizes for kids and dogs at 11 am. There will be prizes for best girl, best boy. and best dog. There are also a lot of food to buy related to Halloween: there will be half price on pumpkins and many winter squashes at Kuhn. And I’ve been meaning to try Copper Pot’s pumpkin truffle soup, it went fast last week so get there early. And of course, you can buy your pumpkin whoopie pies at Pecan Meadow. Farmers’ market starts this Saturday! I’m ridiculously excited for this. The farmers’ market season is my favorite time of the year, I love the ritual of going every Saturday morning, of watching the seasons progress based on the produce available. May 1st will be first farmers’ market of the year, from 9-1. Robin Shuster said to expect asparagus, spring onions, salad greens, leafy greens, as well as apples and pears from last fall to be available. There might even be some early strawberries from Garner’s (yay! I’ll be fighting you guys to get them). There’s also, of course, the great Copper Pot food stand, the bread from Panorama, gelato from Dolcezza, cheese from Keswick Creamery, and flowers from Faucher Meadows. When the 14th and U farmer’s market first opened in May, I showed you what I got for $20. Now, with summer in full swing I got cherry tomatoes, 4 ears of corn, a half pint of blueberries, 2 pints of cherries (white and regular), one lone peach (the only one left when I got there), a more mature but not quite fully mature onion, some baby red potatoes, and a huge French baguette. Not bad, what do you get at the farmer’s market? Plans include grilled corn with ribs for 4th of July, a blueberry and cherry tart, and eating out of hand my first peach of the summer.